The Pz.Kpfw. IV Ausf. C (Panzer IV C) is a Rank I German medium tank with a battle rating of 1.3. It was introduced in during the Closed Beta Test for Ground Forces before Update 1.41. Belly armour is 5 mm thick. Hull underside right above tracks is only 5 mm thick. Ammo racks of the Panzer IV C.
The Panzer IV Ausf. C is a fine tank in Rank I due to its high powered yet low-velocity cannon. It is often capable of annihilating an enemy vehicle with a single HE or HEAT shell, regardless of the angle of the enemy's armour. It has a fair amount of armour, however due to the lack of an actual slope it may seem considerably more fragile than some soviet vehicles when facing AP shells. Against Rank I, it is often wiser to close in with the enemy vehicle, counting on the slower turret speed of the soviet machines, allowing the player to circle around them with ease and deliver devastating shots. Bear in mind that while this tank can easily obliterate any vehicle at its own BR, against higher rank enemies the relatively poor penetration of the gun and very slow shell travel speed can become a problem. Avoiding direct encounters, and using flanking maneuvers is advisable. However, with HEAT ammunition and a skilled player, the Ausf.C can be a great tank. HEAT ammo is difficult to aim due to its very low muzzle velocity, but its superb penetration, unmatched by anything in its rank, renders any enemy armour protection useless. 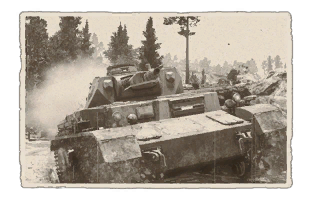 Coupled with fast reload times, the Ausf.C can be a surprisingly effective frontline brawler, crippling or destroying enemy tanks regardless of their armour protection. In this role it’s essential to dispatch the enemy before they can fire – the flat armour cannot protect the Panzer IV against anything at point-blank range. If preferring a safer play style, it can lob HEAT shells from afar – this is difficult task to do, but as HEAT ammo does not lose penetration over distance, the Panzer IV C can destroy targets afar as well as up close and the armour may bounce a hit or two from longer distances. Engaging moving targets is however very challenging. Despite its low penetration, it's actually not that bad. The statistics may indicate low penetration, but remember. The Panzer IV C is at a battle rating of 1.3, it can penetrate actually pretty much everything it meets with normal AP shells. Also, the 75 mm has a very fast rate of fire. The gun size is also fantastic and there are frequent knock-outs with one shot. Don't worry about T-34s or T-50s, at this battle-rating the two won't be a significant. Overall, the Pz.Kpfw. IV Ausf. C suffers from its roots as an infantry support tank and many players will avoid it, but if willing to take up the challenge, one could put the HEAT shells to good use and achieve great results. Further research then levels up to another part of the Pz.Kpfw.IV line – the Panzer IV Ausf. 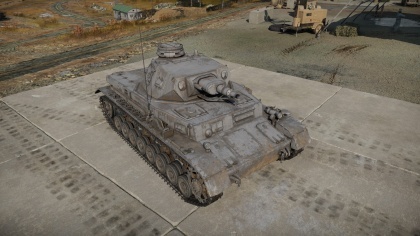 E, sporting additional armour and improved HEAT rounds with 100 mm of penetration. 1) Parts and Turret Drive: the tank is quite robust but some parts are very fragile;- turret can get jammed, and front mounted transmission can get hit. 2) Fire Extinguisher and HEAT: HEAT for use against more heavily armoured tanks. Fire extinguisher to improve suitability, and/or to extinguish engine fires. 3) Other gun enhancing modifications: then the remaining modifications. The Pz.Kpfw. IV's creation, like its predecessor the Pz.Kpfw. III, was devised by Heinz Guderian, where he envisioned a support tank to be used to handle anti-tank guns and fortifications. The Panzer IV was to work alongside the more numerable Panzer III in Panzer Divisions (three company of IIIs and one of IVs) to engage the enemy, giving the role of fighting enemy armoured forces to the Panzer IIIs. As a support tank, the tank was to have the short 75 mm howiter as its main armament and have a weight limit of 24 tons. MAN, Krupp, and Rheinmetall-Borsig worked on the development of the tanks, but the Krupp's model was selected for further testing. The chosen model from Krupp once finished used a leaf-spring double-bogie system for its suspension, doing away the proposed interleaved or torsion bar suspension system earlier devised for the sake of faster production. The vehicle held five crew members, the commander, gunner, loader, radio operator (and hull machine gunner), and driver. Though it looked symmetrical, the Panzer IV turret was actually offset to the left of the chassis center line a bit while the engine was also offset to the right, this was to allow the torque shaft to turn the turret. 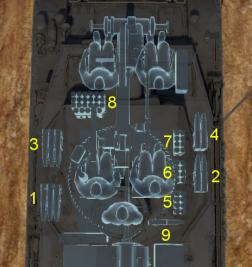 The offset also meant that most of the ammo is held on the right side of the tank in storage areas. The Panzer IV was then accepted into service and production began in 1936. The initial Ausf. A variant of the Panzer IV had armour only about 14 mm, enough to stop small arms fire. It quickly moved on to the Ausf. B with a more powerful engine and transmission, and more armour to 30 mm thick. Then the Panzer IV Ausf. C, introduced in 1938, showed up with a better engine and slightly more armour on the turret to 30 mm. The Ausf. C ended with the Panzer IV with the KwK 37 L/24 75 mm howitzer gun that was capable of penetrating 43 mm of armour with armour-piercing rounds. The tank weighed 18 tons in this variant. The early variant of the Panzer IV Ausf. C and Ausf. D (has 20 mm side armour) saw combat in Poland and France, where its light armour and gun had difficulty against the British Matilda and French Char B1 tanks. A 50 mm Pak 38 cannon was tested on the Ausf. D in response to the threat, but the swift victory of the French campaign ended these tests. After the initial stages of World War II, the Panzer IV Ausf. C saw further upgrades to its later variants. Its next variant, made in October 1940, was the Panzer IV Ausf. E.
This page was last edited on 9 January 2019, at 18:02.